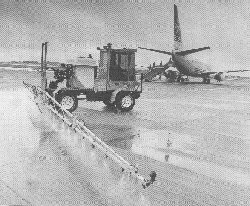 The Agribuggy has been adapted very successfully for the role of airport de-icing. Any of the Frazier range can be adapted with tank capacities of up to 1500 litres. They can also be used during the summer for spraying grass areas and can be fitted with hand lances for spraying smaller areas around airport buildings and gardens. A larger trailed sprayer unit has been developed with a huge 10,000 litre tank and its own power pack to enable it to be towed by any articulated tractor unit. This unit could be built under various configurations eg. as a demountable unit on a lorry, on a four wheel commercial vehicle trailer or on a tandem axle, agricultural type trailer. This first machine was based on one of the earlier Frazier models - the IID. It is fitted with a 900l sprayer, a manual fold boom, a high output pump system and hand lance. The axle gearing has been altered to increase maximum speed and the system is geared to allow spraying at up to 20 mph. The whole machine has been designed to be as simple to operate and maintain as possible to allow for the relatively infrequent use by the operators. Although a machine of this size has a relatively small tank, it is very quick and maneuverable which makes it ideal for working in small spaces. It can also work at very high speed and has been successfully used for spraying main runways and perimeter tracks. A quick filling system can be fitted to allow filling from a large storage tank in a matter of minutes. 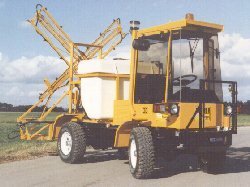 To increase the capacity of the sprayer this 6x4 version of an Agribuggy 3D was built for Leeds Bradford airport. The sprayer specification is similar to that of the machine above but the tank capacity is almost doubled to 1800 litres. Even with the extra weight, the machine is still more than happy spraying at 20mph with a rapid acceleration up to that speed. Self-propelled machines with capacities of up to 3,000 litres are possible based on the Agribuggy range with full hydraulic fold booms up to 24 metres wide. If you have any special requirements within that range please do not hesitate to contact us for a quotation. 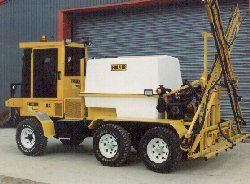 This unit was delivered Leeds Bradford International Airport in October 1997 to run alongside the airports smaller self-propelled Frazier de-icers. 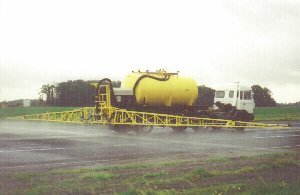 The sprayer is built on an articulated trailer that can be towed by a conventional tractor unit. The stainless steel tank carries 10,000 litres of de-icing fluid and the standard boom width is 24 meters. Fitted with its own engine driven hydraulic powerpack, the unit is completely self contained. The self-levelling boom folds hydraulically and the spray pump is hydraulically driven. Spray controls, hydraulic controls, lamps, boom lights and beacon are all electrically powered from a compact pod in the cab next to the operator. This is an extremely versatile machine with high output capability, working speeds of up to 30mph, capable of applying different rates and very easy to operate.